President Donald Trump hit China with tariffs on another $US200 billion worth of Chinese goods. The move is seen as a major escalation of the US-China trade war. China is expected to respond with more tariffs. Economists expect the tariffs to increase the cost of goods for US consumers and possibly slow the broader US economy. 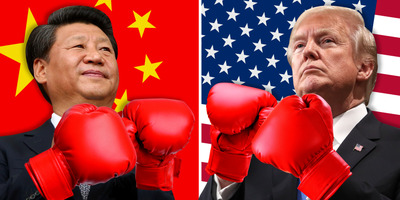 President Donald Trump ordered the US Trade Representative to impose a tariff on $US200 billion worth of Chinese goods, catapulting the US-China trade war to the next level. The latest tariffs, along with previous rounds on $US50 billion of Chinese goods and metal imports, will mean over half of all Chinese goods coming into the US are subject to the duties. China’s Ministry of Commerce has promised to respond to Trump’s latest attack with tariffs on $US60 billion worth of US goods. This means that between 85% and 95% of American imports coming into China will be subject to a tariff from the trade war. According to a senior administration official the duty levied on the incoming goods will be 10% when the measure goes into effect on September 24, then the tariffs will increase to 25% at the start of 2019. The delay is partly designed to give US businesses time to adjust their supply chains the official said. In addition to being much larger than previous rounds of tariffs, the new set zeroes in on different targets. The first round of tariffs on $US50 billion worth of Chinese goods focused almost exclusively on industrial goods, but Monday’s tariffs also included a large amount of consumer goods. The final list of goods was tweaked slightly from the initial list released in July. Roughly 300 items, or tariff lines, were removed from the list including consumer electronics such as smartwatches, industrial chemicals, safety products like bicycle helmets, and child safety furniture like high chairs. Despite the removals, the administration still expects the total value of the goods subject to the tariffs to be $US200 billion. The move willy also solidify Trump’s commitment to to the trade war despite the Treasury Department’s recent overtures to Beijing. China will reportedly decline further talks if Trump goes through with the tariffs on Monday. Talks with the Chinese have so far been unproductive, the administration official said, despite clear signals from the US on what needs to be done by China in order to reverse the tariffs. The Trump administration launched the trade war due to allegations of intellectual property theft by China. The White House has argued that the tariffs are necessary to pressure Beijing to change fundamental economic practices and protect US businesses operating in China. The president also threatened to slap tariffs on another $US267 billion worth of Chinese goods, which would mean all imports from China would be subject to duties. Economists estimate the tariffs will prompt an increase in prices for both US businesses and consumers. That could slow spending on large investments and consumer purchases, potentially harming the broader economy. Stocks declined on a pre-announcement statement by Trump’s pre-announcement statement with the Dow Jones industrial average closing down 91 points, or 0.35%, for the day. March 22: Trump announces plans to impose a 25% tariff on $US50 billion worth of Chinese goods. China announces tariffs in retaliation to the steel and aluminium duties and promises a response to the latest US announcement. April 4: China rolls out a list of more than 100 US goods worth roughly $US50 billion that are subject to retaliatory tariffs. May 29: The White House announces that the tariffs on $US50 billion worth of Chinese goods will move forward, with the final list of goods released June 15. The move appears to wreck the nascent trade deal. June 15: Trump rolls out the final list of goods subject to new tariffs. Chinese imports worth $US34 billion would be subject to the new 25% tariff as of July 6, with another $US16 billion worth of imports subject to the tariff at a later date.China retaliates with an equivalent set of tariffs. July 6: The first tranche of tariffs on $US34 billion worth of Chinese goods takes effect; China responds in kind. August 3: China says it will impose tariffs of various rates on another $US60 billion worth of US goods if Trump moves forward with his latest threat. August 7: The US announces that the second tranche of tariffs, which will hit $US16 billion worth of Chinese goods, will go into effect on August 23. August 23: The US imposes tariffs on another $US16 billion worth of Chinese goods, and Beijing responds with tariffs on $US16 billion worth of US goods. September 7: Trump says the tranche of tariffs on $US200 billion worth of Chinese goods is coming “soon” and threatens to impose tariffs on another $US267 billion worth of Chinese goods.